Artisan POS 4 allows importing files for different types of records. Only RAW imports can be done; that is the user needs to compile a file to meet a specific format we will describe below on this article, once the file is in one the recommended formats then we can use the Raw Import Utility in Artisan POS 4 to add records to the current database. IMPORTANT: Before importing any files into Artisan’s database, MAKE A BACKUP of your data in case you do not import what you wanted and want to go back to a previous point in time. 3. 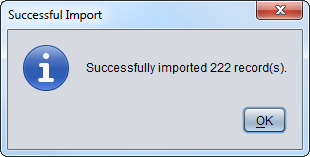 Lastly, we import the file using Artisan Raw Import tool located at Header Menu=>File=>Import. If you wanted to import categories without much detail or levels, then this would be the file format you need. If you are using a program like Microsoft Excel, here is an example of a file ready to be imported with the proper column headers. * Notice the column header names are different on the file from what Artisan shows once imported. 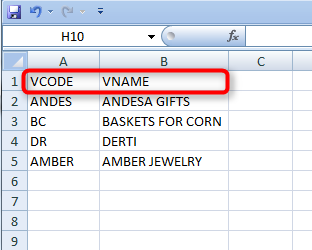 Artisan needs a specific code to identify the data being imported and those codes are given to you on this article. 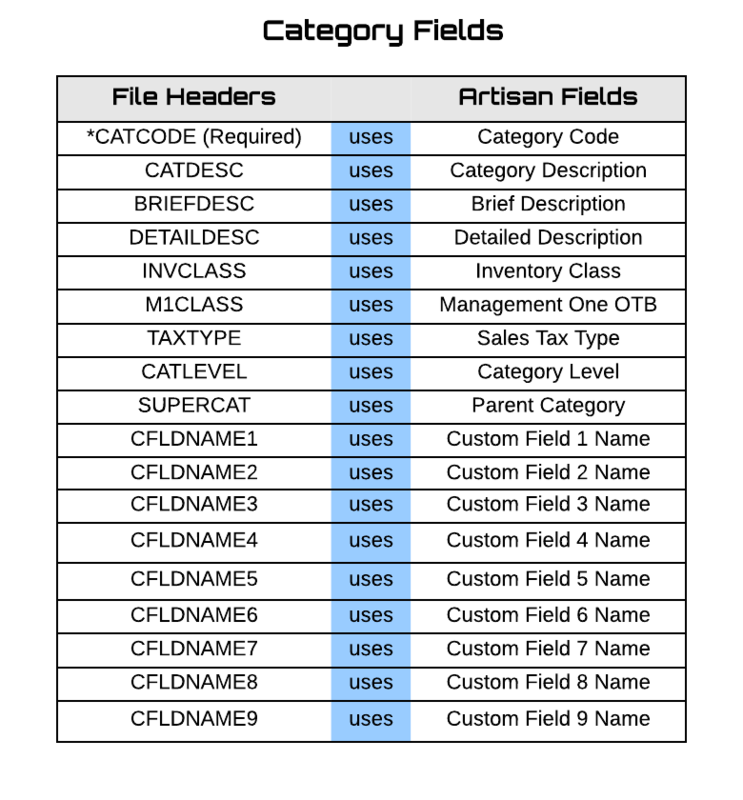 If you import a file with column header names different from what is given on this article, Artisan will ignore the data under that column entirely. To avoid this from happening make sure you use the column headers appropriately. 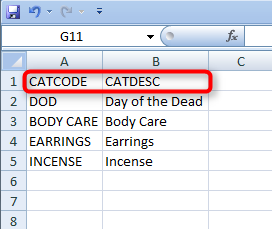 * Only CATCODE (Category Code) is required when importing categories. If Category Code already exists in Artisan database then the specific category will only get updated with any new information that differs from what is already in Artisan. Format your Categories File accordingly. Then proceed to the bottom of this article for instructions on how to import it into Artisan. The procedure for Vendor Records is similar to any other type of records, including category records. 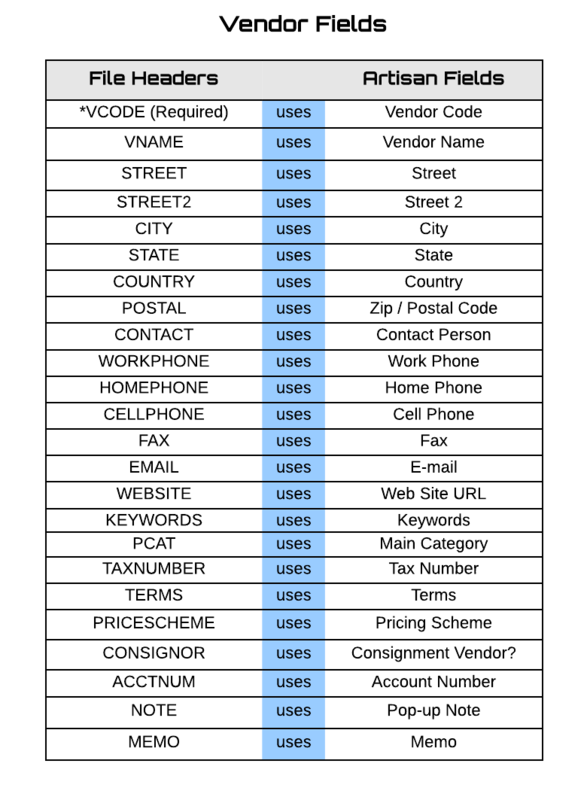 The only things that differ when importing vendors are the fields (or column headers on a file) that can be imported as Vendor Records. 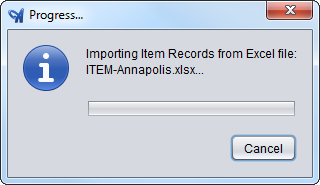 If you wanted to import vendor records without much detail, then this would be the file format you need. 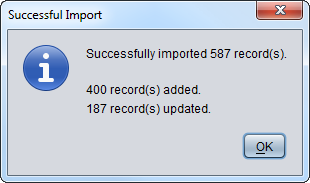 If you are using a program like Microsoft Excel, here is an example of a file ready to be imported with some vendor records. If Vendor Code already exists in Artisan database then the specific vendor will only get updated with any new information that differs from the records already in Artisan. Format your Vendors File accordingly. 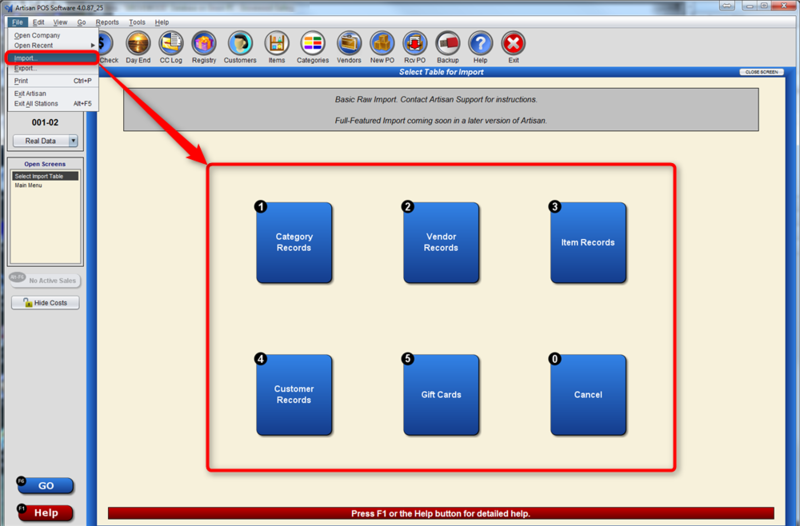 As you can see on the image above, items need more information as they are usually linked to a vendor and a category. By Importing all of this information with all items, Artisan will place the items in the right location and avoid duplicates. 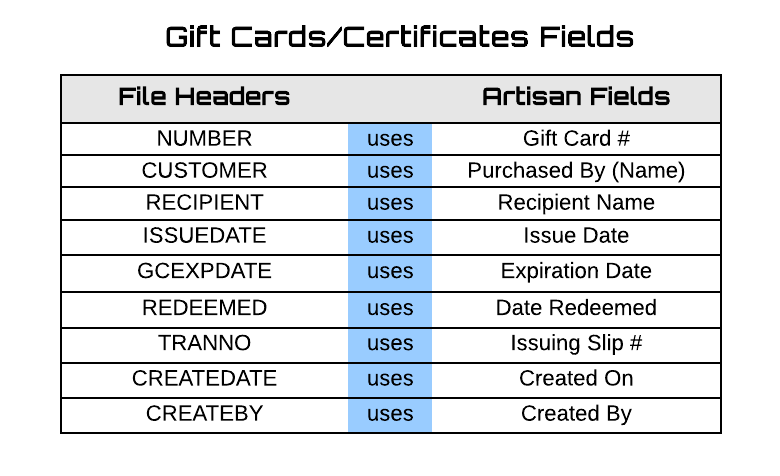 In Artisan, the “Vendor” column shown on item records is the actual Vendor Code. Here’s an example of a file containing item records ready to be imported into Artisan. 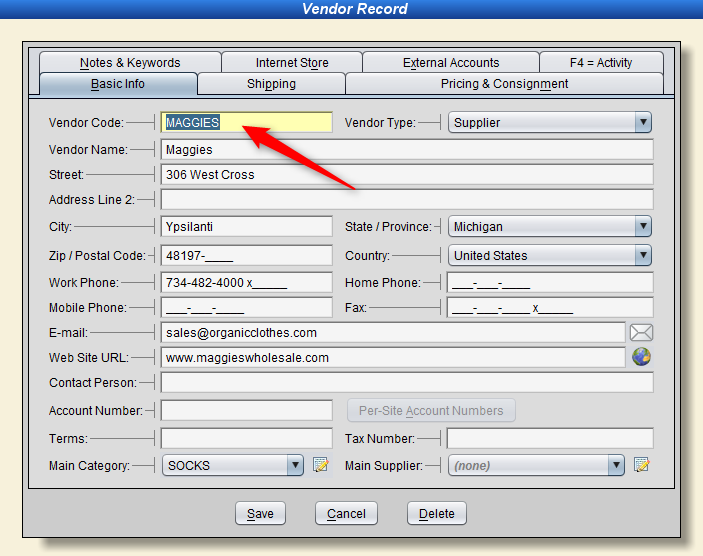 Notice we have more information for item records file than we usually have when importing categories or vendor records. As discussed above, items need to be matched to a Vendor and a Category to avoid creating new items that could possibly be duplicates. 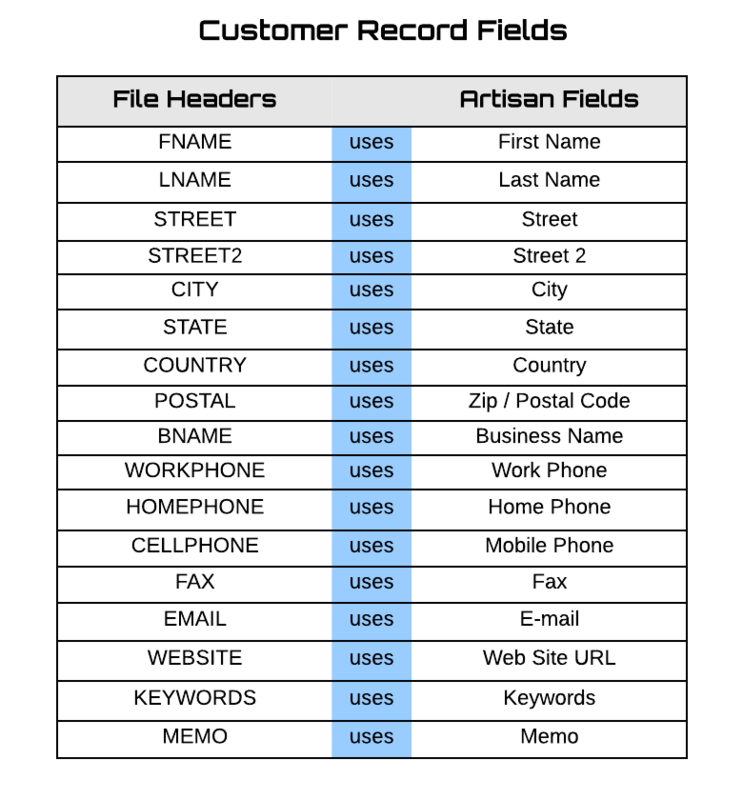 By matching the items to a Vendor and a Category, Artisan will matched them to their respective locations in the database and save you a lot of work. 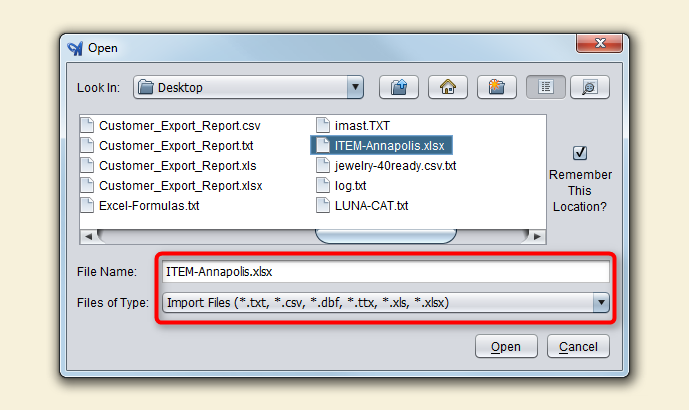 The example above is what most people use when importing basic information for item records. This will populate Artisan’s database accordingly and give you the ability to change or update items later by doing another import or a Bulk Change within Artisan POS. If you import an item that already exists in Artisan’s database where UPC and Vendor Part Number match the existing record, it will only update the item if anything is different on the new record. Format your Item Records File accordingly. It is possible to import Gift Card/Certificates records into Artisan but this needs special attention as it deals with credits/money. Creating Gift Cards through an import is intended ONLY for cases where a Gift Card/Certificate was previously issued (sold) using an older system “prior” to using Artisan. Use the fields below to format the column headers on the Gift Cards files to be imported. – Now that the file has been formatted according to the instructions above, you should have the file saved on the computer where you plan to do the import on. – The file must be closed when importing in Artisan, it cannot be open on another program. 1. Now, Go to Artisan=>Header Menu=>File=>Import. Choose the type of records you are importing. 2. Choose File that has been created and select “Open”. Once “Open” is selected Artisan will start importing the items and a progress bar will be displayed. This step is not required as part of the import but will ensure everything went well with your files and allows you to reverse the action if needed. It is good practice to check the records were imported as intended. 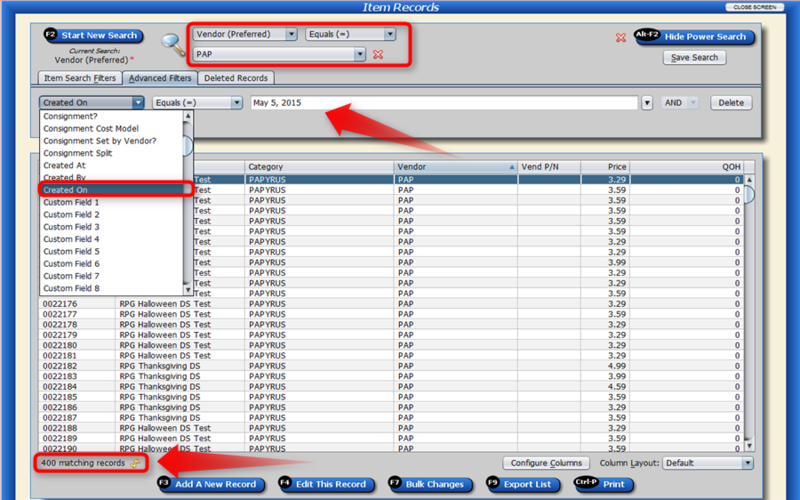 Artisan offers its user the ability to search for these records through a “Power Search”. *if you are not familiar with the Power Search feature in Artisan, learn more about it on this article. 1. In Artisan, go to any type of records you’d like to search. In this example, we will use Item Records but other records work in a similar way, just different fields. Select the Vendor to narrow down the list of items. In this case, PAP – Papyrus is selected. Notice there are 2,115 records for this vendor before importing any item; this is usually a good check before importing records to compare once imported. 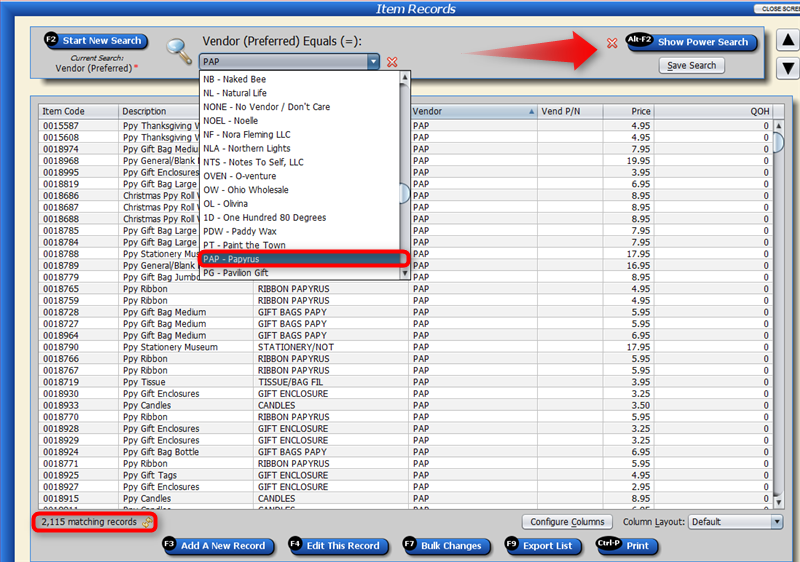 Under the Item Records Screen, select Power Search tool by the right side of the window. 3. Using the Power Search tool follow the image below to query the database through filters. First, we will look at the new items added. Notice we choose “Created On” and then picked the date. We can see that it shows 400 items that were created. 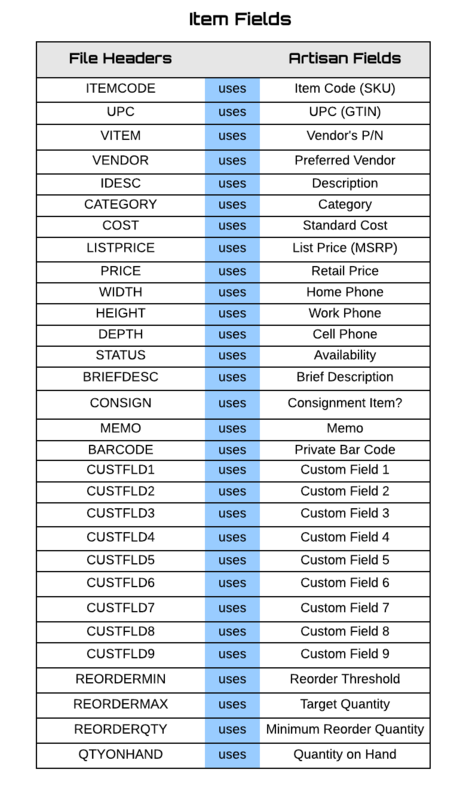 You have the ability to use whatever field you want to query the database. We could have used Created By and choose a user to see who added the items or even add more filters to have a combination. Feel free to experiment with other fields to see the information retrieved.